Did we ever mention that this year we are doing a Coast 2 Coast Cycle Challenge? This takes place in August 2014 and takes us from Whiteheaven to Scarbourgh - 186.1 miles in total over 3 days. So it is the AGM tonight at Appayon in Poynton, and time to thank Trevor P and his team for an excellent year. The new chairmen is Mark T and the key roles of Treasurer, Bonfire, Community Service and Santa have all been taken by relatively new guys within Poynton Round Table, so thanks to those who have stepped up to move Poynton and District Round Table into a new area. The team looks very strong and there are some great fits into the roles. It has the feeling of another excellent year, programme and social events look good, we are looking forward to another excellent (and hopefully dry) bonfire, and if we can get anywhere close to last year’s excellent chairman’s weekend we should be in for a treat of a long weekend away. The numbers are in and unfortunately the amount we have to donate in 2014 is lower than in the previous few years, mainly due to the poor weather at the Poynton Bonfire. However we have still just donated over £6000 to local charities, clubs, associations and good causes in Poynton and the surrounding areas! Poynton Round Table is always on the lookout for new members. We are a social bunch of lads (currently about 20 members) who meet twice (sometimes three times) a month to do stuff you wouldn’t normally do, e.g. Indoor Skydiving, Flight Simulator, Fencing, Kayaking, Karting, etc, and sometimes things you might normally do, such as go to the Pub, Meals out, Mountain Biking, etc. The aim of Poynton Round Table events is to have fun, try activities you maybe haven't tried before, be social, have a laugh, and always try and squeeze in a beer or two. So we've been busy coming up with ideas and a plan for our events in 2014. It is a good mix of the new, unusual, regular, indoor and outdoor, active and social, making 2014 look like a good year. 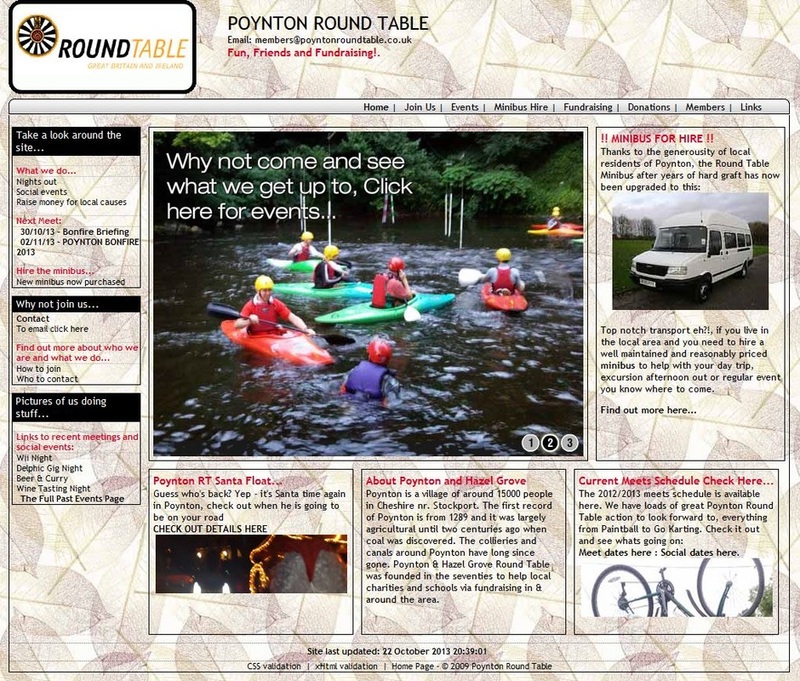 Why not come along an give Poynton Round Table a go? Your first few events are FREE. Happy New Year to everyone from us all at Poynton Round Table. We've just published out programme of events for 2014. The aim of Poynton Round Table twice monthly programme events is to have fun, try activities you maybe haven't tried before, be social, have a laugh, and always try and squeeze in a drink or two. So we've been busy coming up with ideas and a plan for our events in 2014. It is a good mix of the new, unusual, regular, indoor and outdoor, active and social, making 2014 look like a good year. Why not come along an give Poynton Round Table a go? To see the events either vist the events page on this website or go the the events section on out facebook site. Anway we hope you like it. Please add any comments. But so we don't forget the last website, here is a screenshot for posterity.